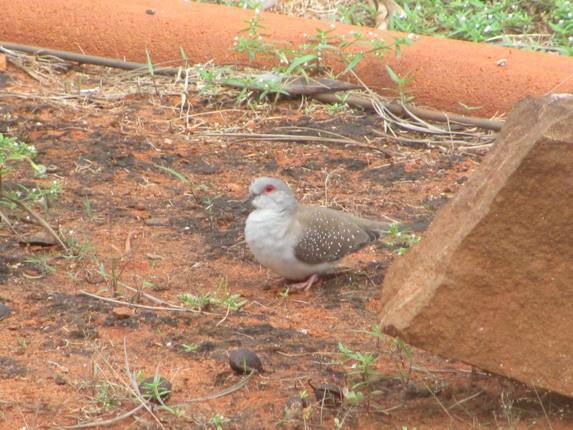 Diamond Doves Geopelia cuneata are the smallest Australian dove and they are ground feeding seed eaters. They need water on a regular basis and as a result of this they may be found in large flocks on occasion at ephemeral lakes, but generally they are just in pairs. 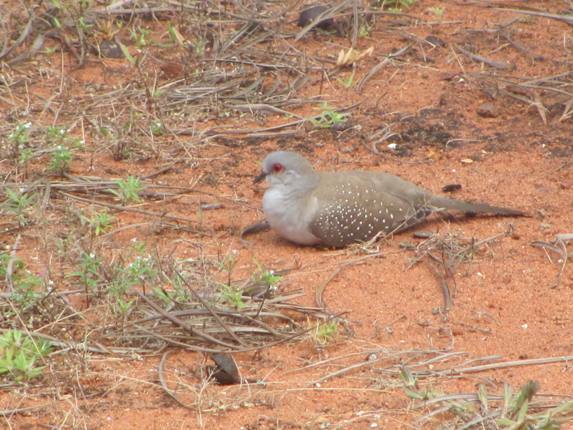 Their most distinctive feature is the bright red around the eye and it is very hard to mistake them for any other bird. 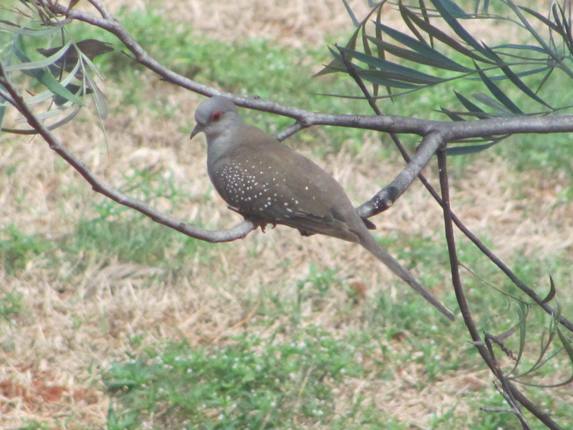 The most similar species in size and feeding habits is the Peaceful Dove Geopelia striata, but they have a barred wing and neck rather than the spotted wing and plain neck. 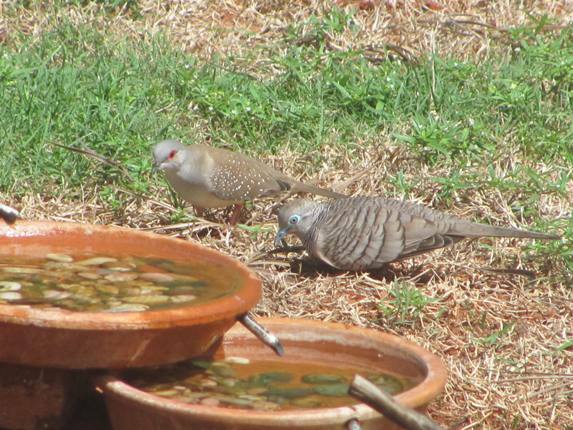 Around Broome it is very common to see Peaceful Doves, but on one occasion recently-for the first time-I was able to photograph a pair of Diamond Doves in our garden. I was faced with the challenge of photographing through a window initially and then crept towards a door and opened it carefully to get some further photos. 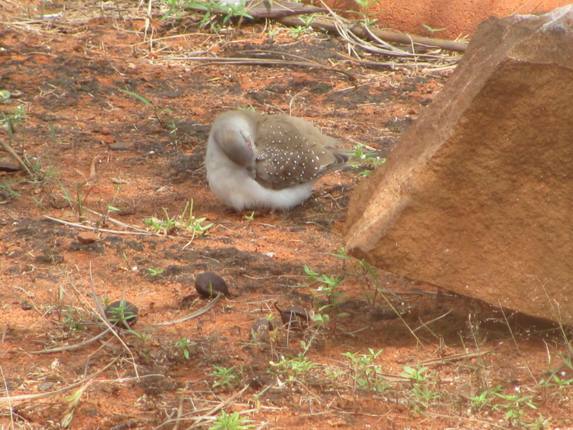 Here are two photos to demonstrate the difference between a Diamond and a Peaceful Dove. As you can see they are rather different when you put them side by side. We hope they visit again! I like those doves. Their tails are surprisingly long, almost as long as the tail of a parakeet. I like them too. 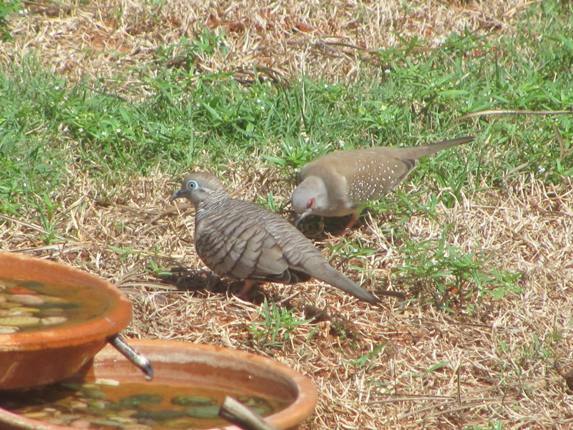 They remind me of Columbina doves from the Americas. Very cute! The Peaceful Doves’ eyes are amazing. 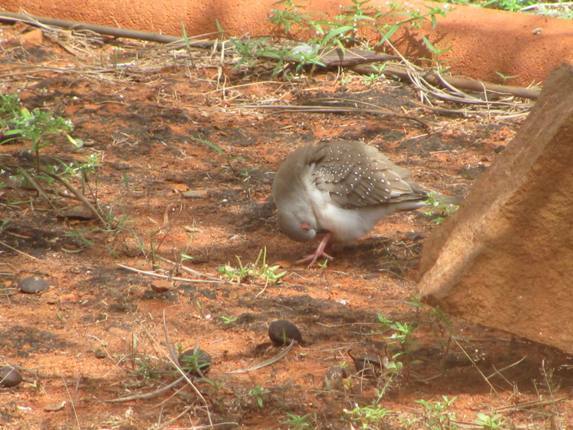 Hmmm, there is no dangerous critter in this post, so I suppose the Peaceful Dove has been given such a nice name to hide its horrific habit of … you know … being somehow really dangerous to birders.